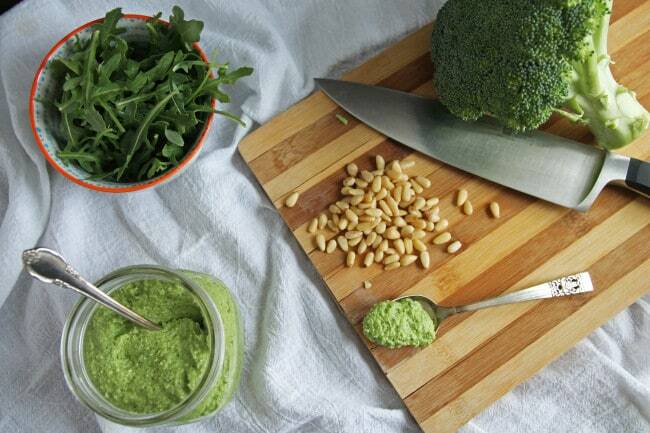 Bright broccoli arugula pesto with pine nuts and Parmesan makes for the perfect accompaniment to any dish. This post is sponsored by Diamond of California, but all opinions are my own. Thank you for supporting brands that make this site possible. Helloooo, friends! Greetings from the new Mrs. Predmore! <–Someone tell me when that will stop being weird to me. I promise a full wedding post once we get our pictures back from the photographer (because visuals), but for now I say that Alex and I felt that the day was absolutely perfect. 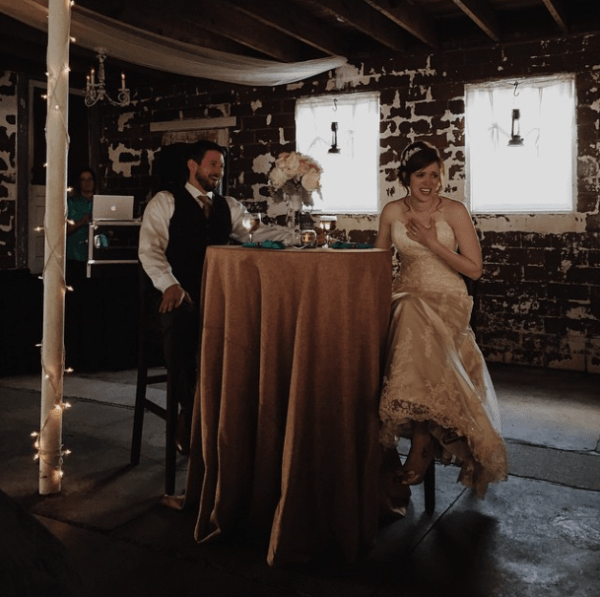 From the weather (80 degrees and sunny, which is basically a miracle for mid-April in the good ol’ Midwest) to the food to the guests, we were surrounded by beauty and love and could not have asked for more. Alright, down to Broccoli Arugula Pesto – because I owe you guys something green and healthy. I promise, cake is on the way, but for now…we pesto. Homemade pesto is one of our favorite things to keep on hand. It is easy, freezes like a dream (and, relatedly, thaws quickly), and makes for a healthy topping to pasta for a super simple weeknight dinner. We like to toss together some whole wheat pasta, a dollop of pesto, some seasonal veggies and some roasted shrimp or chicken for a meal full of all kinds of good-for-you things. I often reach for spinach or kale (or even both, as in my Spinach and Kale Pesto) instead of the traditional basil when making homemade pesto, but occasionally I like to really go for the nutritional gold and I throw in an entire head of broccoli instead. In this version, I added some peppery arugula, some pine nuts and some Parmesan to help round out the flavor. The best part is that this Broccoli Arugula Pesto doesn’t even necessarily taste like broccoli – my husband (ok, yep, still weird!) fed some to his coworker, a self-proclaimed broccoli hater, and he had no idea it had broccoli in it – he just thought it was delicious! 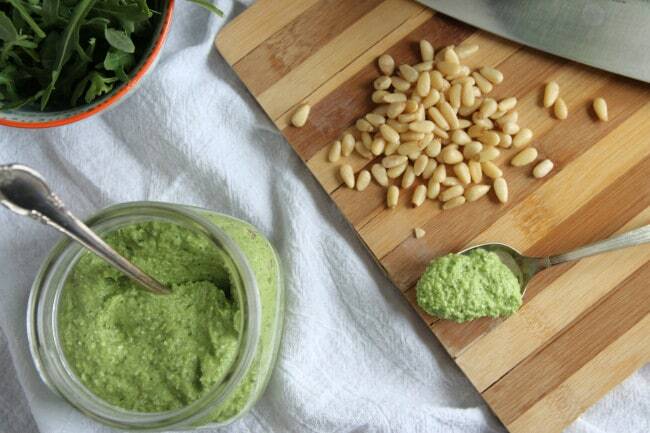 Make this Broccoli Arugula Pesto immediately. The 10 minutes it takes will convince you to bypass the jarred stuff forever. 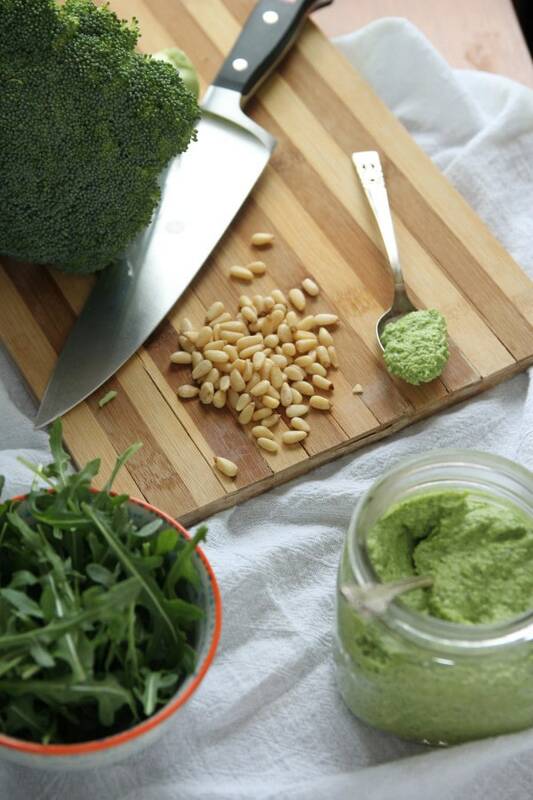 Bright broccoli and arugula pesto with pine nuts and Parmesan makes for the perfect accompaniment to any dish. Bring a large pot of water to a rolling boil. Add the broccoli florets and boil for 3 minutes. Remove from the boiling water and immediately place in an ice bath to halt the cooking process. Once cooled, drain well. In the bowl of a food processor or a high-powered blender, place the cooked broccoli, arugula, lemon juice, pine nuts, garlic and cheese. Pulse until combined. Stream in the olive oil and process until smooth. Season with salt and pepper to taste. It takes a long time to get used to the new name. And then your brother marries someone with the same first name as you just about the time you’ve gotten used to your new name, and someone then has your old name. You are then back to getting used to a name change. Thankfully, I didn’t grace your life with a brother, so that’s not an issue for you. It helps once you have children and they call you by your last name. That wasn’t a hint. Well, not a big one, anyway. Making this later this week. I need a quick meal. Yaaaaay MRS. Predmore! I’m so happy for you little lovebirds! You’re such a beautiful couple (seriously, I’d do ya. Kidding..not kidding…wow, that was awkward). DIS Pesto! So healthy and flavorful and whoa I need it all over everything!